The Pattaya Women’s Development Group hosted a food-preparation class to help members earn more money with their culinary skills. 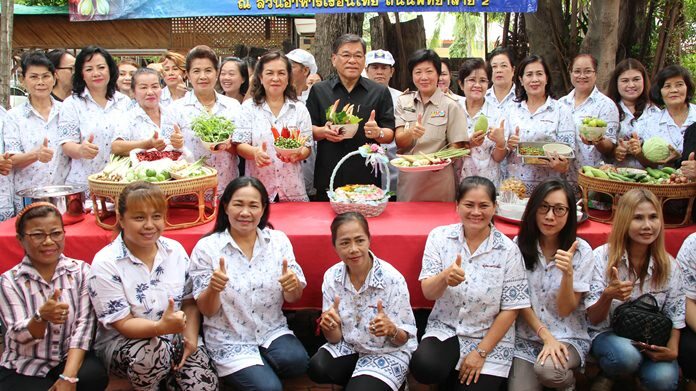 Pattaya Deputy Mayor Vichien Pongpanit opened the July 24 workshop at the Ruan Thai restaurant where the city’s Social Development Department showed how to prepare five different signature Thai dishes. On the menu were gang pha pla hedkhon (jungle curry), nam prik kapi, mango and fresh vegetables nam prik, fish yellow curry, kua kling moo (pork kua kling), and fishcakes. More than 30 women studiously followed recipes and then enjoyed the fruits of their labor. The hope is that women looking to earn additional income can sell popular meals.